PARIS (AP) — Kylian Mbappe scored four goals, earned a penalty and also hit the post in a memorable performance for Paris Saint-Germain in a 5-0 league rout of Lyon on Sunday. 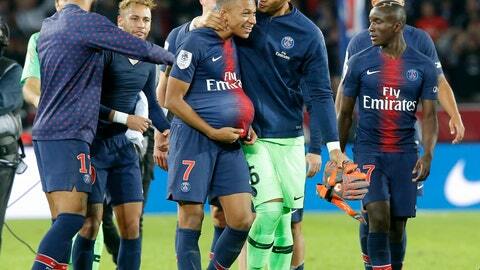 PSG became the first team ever to win its first nine games of a season in Ligue 1. A foul on Mbappe set up Neymar’s early penalty before Mbappe scored four times over a 13-minute span of the second half. Mbappe hit the post shortly after the break and then scored in the 61st, 66th, 69th and 74th minutes — the first with his left foot and the next three with his right. The 19-year-old star of France’s World Cup title run this year, Mbappe became the youngest player to score four goals in a French league match in 45 seasons. PSG was reduced to 10 men when defender Presnel Kimpembe was sent off with a straight red midway through the first half. But then Lyon was also left with 10 men when Lucas Tousart picked up a second yellow for a foul on Mbappe in first-half stoppage time. With its ninth win in nine matches, PSG moved back to eight points ahead of second-place Lille, which beat Saint-Etienne 3-1 on Saturday. Also, third-place Marseille beat Caen 2-0 with goals from Kostas Mitroglou and Florian Thauvin. Rennes defeated 10-man Monaco 2-1 with Hatem Ben Arfa scoring the winner. Damien Da Silva had put Rennes ahead before Radamel Falcao’s equalizer. Andrea Raggi was sent off in first-half added time. Bordeaux beat Nantes 3-0 with a brace from Francois Kamano and another goal from Yann Karamoh.